It's late afternoon on a blustery October day. Rev. 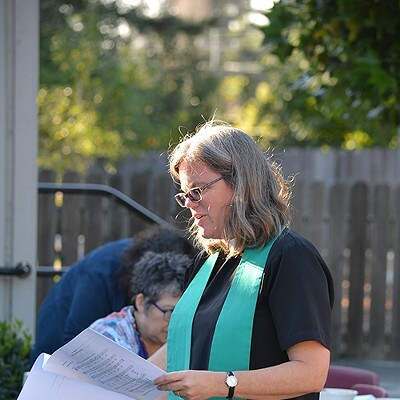 Sara Potter of St. Alban's Episcopal Church in Arcata bends over the leaf of a plant outside the wall of the sanctuary and speaks in hushed tones for a few minutes before she makes the sign of the cross and moves on. Tucked within the greenery and out of the public eye is the tiniest of creatures, a red and black woolly bear caterpillar, deposited there by 3-year-old Collin Coriell. Earlier, the young church member gingerly scooped it up from the church's doorstep to move it away from foot traffic. 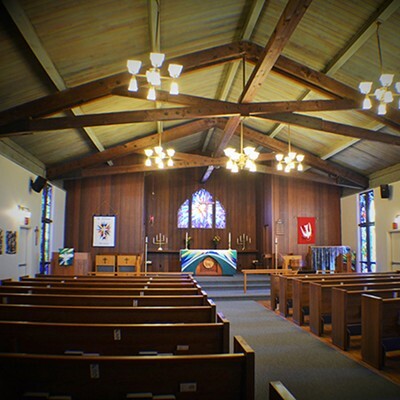 St. Alban's Episcopal Church is a welcoming place. Its doors are open to people of all walks of life, and around the first Sunday of every October, it's open to animals, too. The Blessing of the Animals is a tradition enacted in many churches in recognition of the Feast Day of St. Francis of Assisi every year. 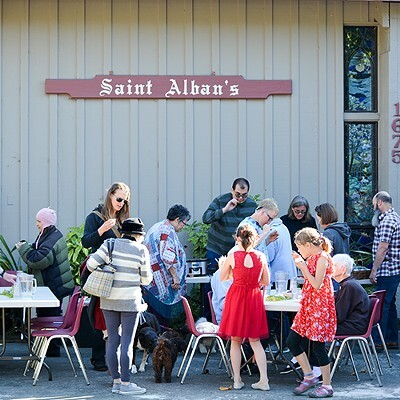 This year, St. Alban's held its Blessing of the Animals service on Oct. 8 at 4 p.m., starting things off with a parish chili cook-off with about 20 people and 15 pets arriving for the service and feast. Trees are awash in full fall foliage in the quiet residential neighborhood in Sunny Brae where St. Alban's is located. Leaves swirl in the late afternoon wind, a bit strong even for October. Dogs bark at each other in excited greeting. Toenails scrape and click on the pavement. Children laugh. Stapled papers with the hymns, prayers and program for the service flap about on white tables adorned with green leaf cuttings, held down by bowls of fresh grapes, stacks of plastic glasses and pitchers of water. A man sets a small carrier down on a table. Inside, two slender black cats peek out, quiet as mice. As the wind blows, seeming to usher them into the parking lot, members of the congregation arrive with animals in tow, or being towed by animals, for the blessing, one the church's most popular events. Everyone lights up at the chance to talk about their pets, the church and its members, and the saint being recognized today. Most of the pets are rescues. Once outcasts themselves, these animals in need of love, care and shelter now arrive well fed and well loved. Francis of Assisi would be pleased. St. Francis, recognized as the patron of animals, merchants and ecology, was a man from a wealthy family and spent much of his youth carefree, the life of the party. After he was captured during an armed conflict and held captive for a year, he returned home a changed man. He gave up all his family's riches to live an ascetic life, wandering the streets in poverty, caring for the poor, sick and outcast, to live the way Jesus lived — no possessions, connecting with the creation around him, all the expressions of God. He rid himself of status and power to allow the will and grace of God to move in and through him so that he could connect with humbler, simpler things: the earth and its elements, animals, people of all walks of life, and spreading the word of God's goodness. The way he chose to live contradicted the way of the world then and now — a world that praises and rewards status. Potter, also known as Mother Sara, says, "We quip that Francis is one of the most admired and least imitated saints." The inside of St. Alban's sanctuary is stunning but warm and comfortable with wood flooring, sturdy exposed wooden rafters and an organ loft high behind rows of smooth, solid pews. Metalwork depictions of the Stations of the Cross, a 14-step Catholic devotion that commemorates Jesus Christ's last day on earth, line the walls. The depictions, arriving last year from Haiti just in time for Lent, include a fair amount of flora and fauna, which Rev. Potter says complements the space. 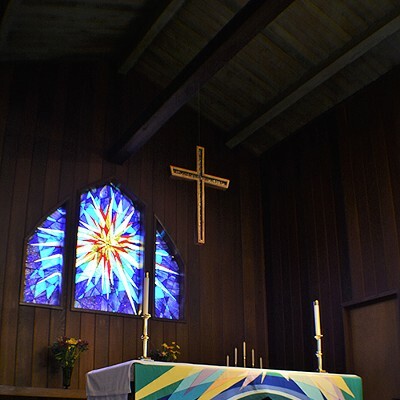 Jeanette Frey Carson, an artist who lives in Ukiah, designed the church's stained glass windows, beautiful balances of transparent and opaque glass in rich purples, blues and greens portraying the rural beauty of Humboldt's redwoods and rivers. The Blessing of the Animals, however, takes place outdoors in front of the church. In previous years, when the blessing was held inside, a few dogs grew squirrely, not unlike children who have to spend quiet time in an enclosed space when there are trees and birds and open air right outside stained glass windows. Holding the blessing outside with a crumbling, cobweb-covered statue of St. Francis watching over seems fitting. The animals are more relaxed, there's room to move about and all the elements of creation Francis revered: sunlight, fresh air, birds and the sky. The Lord God made them all ..."
It is a hymn penned by Cecil F. Alexander in 1848, but Francis of Assisi could have written it himself centuries ago. 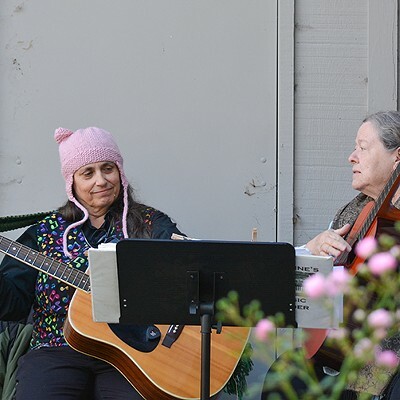 Following the song, the group reads St. Francis's most famous writing, The Canticle of the Sun, which exalts God for making all of nature, including Brother Sun and Sister Moon. Francis referred to all creatures as brothers and sisters just as he did the sun and moon and even death, as he lay dying. For St. Alban's service, the canticle has been divided into parts for the "dog people" and parts for the "cat people" to read aloud separately. "What if you're both?" someone asks. People laugh. "Read them both!" Someone answers. Many did. Jeremy Webb is one of the "cat people." Ruby and Doc, a couple of rescues from Humboldt Animal Rescue Team with petite faces, and nearly identical except for their different colored collars, sit snug in their carrier. Webb, a jovial guy with a big laugh and a long salt-and-pepper beard, is a local actor who recently appeared in The Legend of Georgia McBride, Richard III and Beauty and the Beast. "I got my start in theater through this place," he says. "A woman turned around one day and said, 'You sound like a tenor. You should be in the choir.' And then the choir director was like, 'The tenor dropped out of this thing. I need you to be in it. It'd be a huge favor for me.' So, I got to be Pedro in Man of La Mancha down at Ferndale Repertory Theater. I ended up getting a job there working as their master carpenter for a while and just learned about theater. Did tons of support roles and now I get lead roles." He laughs. "It's a lot of fun. It's been a great opportunity for me. It's been a huge blessing in my life." Blessings abound and are bestowed as Potter makes her way to each table, chair or place on the curb and says a prayer with each animal while people socialize or observe. It is an intimate event between the reverend, the animal and the owner. The prayer she speaks is a general one to give thanks to God for the animals and the companionship and the joy they provide their owners. 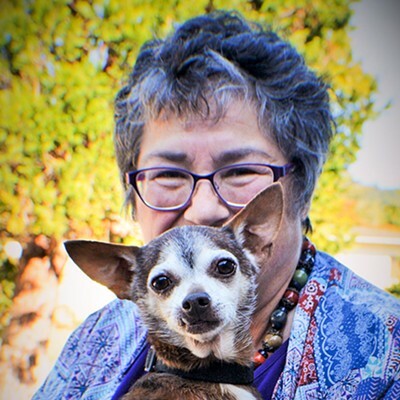 There's Tony, an elderly Chihuahua with a pronounced snaggletooth, and Percy, a poodle-like dog cradled like a baby in the arms of a young girl. Both of them belong to Diana Cooper. At one table, an older golden lab raises his gray muzzle and kisses Potter as she leans in to bless him, nodding his head up and down and side to side and whimpering happily. She looks into his eyes and strokes his muzzle, quietly speaking the blessing. He goes still, listening. For a few moments, theirs is a deep communion. As she finishes, the dog's excitement picks up again. She tries her best to make a steady cross on his moving forehead, "In the name of the Father, the Son and the Holy Spirit. Amen." He makes a happy doggy sound, a tiny howl, as she moves on to the next pet. His owner grins at me. "He's feeling the spirit." 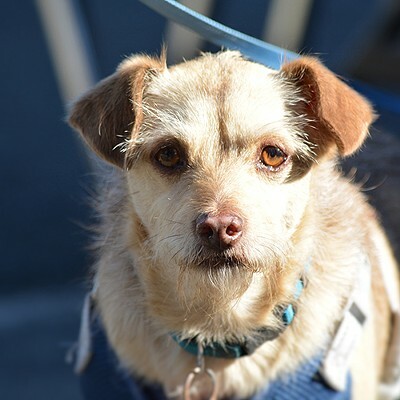 More animals are blessed, like Dinah, a sweet, but cautious medium-sized dog, also a rescue, who belongs to Emily Armstrong Buck. Armstrong Buck has been coming to the church practically since birth. "I was baptised and confirmed here when I was like a week old." 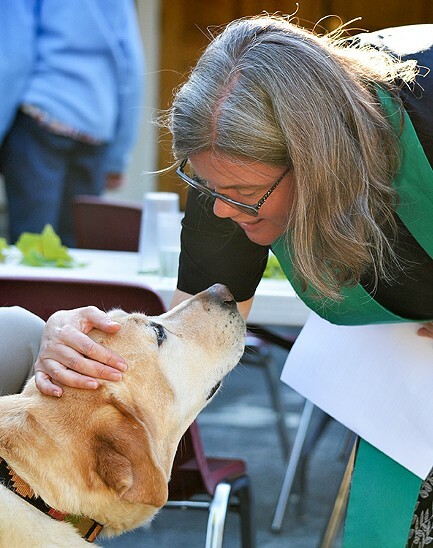 Dinah the dog stays close to her side, devoted, and wears another symbol of devotion around her neck — a canine collar emblazoned with the Shield of the Episcopal Church. Armstrong Buck lights up, smiling at the mention of it. "Yeah, we got that at the convention for the whole diocese one year. I saw they were selling Episcopalian collars and leashes and couldn't help myself." 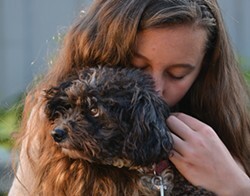 And then there's Chica, a young Havanese who belongs to Emily Arents, a member of the church for 18 years. She holds the soft, curly-haired salt-and-pepper dog in her arms and smiles, "It's fun to get the dogs together." But it hasn't always been just cats and dogs. "Sometimes we have chickens," she laughs. Previous years have seen ferrets, a bearded dragon and even a horse or two. 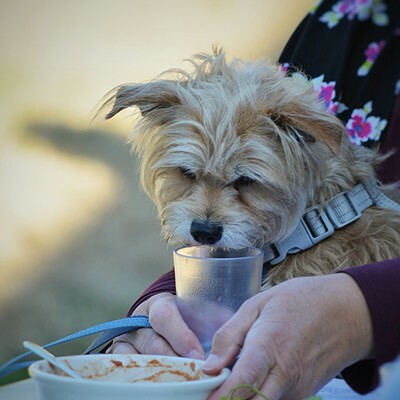 Later, we catch Chica standing on her hind legs at the chili table, peering up, taking tiny steps like a dancing dog, her little black nose wriggling. "She makes me laugh every day," Arents chuckles. One of the more well-known stories associated with St. Francis is his Sermon to the Birds, in which Francis was so eager to go off and spread the Good News that he stopped to talk to a flock of birds. He told them of their magnificence and their connection with God — how they should praise God for blessing them with clean air and feathers and wings to fly. He spoke to them as if they had reason, referring to them as his brothers and sisters. Legend tells the flock stayed and listened, allowing him to move among them and touch them. Francis is often depicted with birds on his shoulders, in his hands or gathered around his tunic. Like a deft puppeteer, Kate Lehré steers and guides two leashed terriers, Charlie and Sammy, and manages not to trip as they dart between her legs and tangle themselves up in their leashes. Again, both dogs are rescues. "We were taking [Charlie] on a walk and we met [Sammy]. A volunteer was walking Sammy and Charlie just fell in love with him." She laughs. Lehré asks why I didn't bring my 9-year-old pug, Hannah, after I tell her I have a rescue at home, too. I explain it would be too much to watch her and interact with everyone, but I may be back next year with her. She encourages me to bring her and, if I'm working, to bring a friend to watch her until it's time for the blessing. "It's nice when they actually do the blessing if you can hold the dog because they bless your relationship," she says, choking up a little bit. "They bless the comfort that you give each other." Not everyone who comes to the blessing has their pet with them. "I had a couple people who did not bring their cats but they still wanted me to pray for their animals," Potter says. "So they brought out their iPhone to show a picture of their cats." Feeling encouraged, I do the same, bringing up a photo of my pug. Potter bows her head with me and touches the photo of Hannah on my phone. She gives a quiet blessing and at the end, swipes up and down and left and right, "Amen." I don't know if Hannah felt a thing, but I did. Lehré was correct, even sans her physical presence in my arms, it is an emotional thing and I tear up. Some just clap their hands, or paws, or anything they've got now!" The group loves it. Everyone is on the same lighthearted page. The ceremony ends with a call to go forth and to love and serve all God's creatures, including the smallest among us. Blessed by loving hands that carry them to places of safety and gentle words that acknowledge and uplift them. Just like young Collin Corielli's caterpillar. After the little creature was blessed, a church member sitting across from me smiled. "That's how we do it. We bless them all." 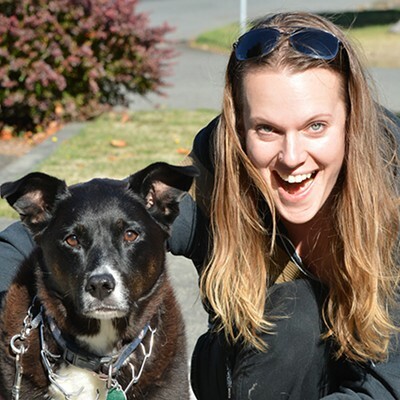 Kali Cozyris is the North Coast Journal's calendar editor. She can be reached at 442-1400, extension 322.